VERY NICE QUALITY FOR THE PRICE... well made and sturdy.......received within a week...i would recommend this item....very comfortable but I am making cushions to match my valances to complete the look! 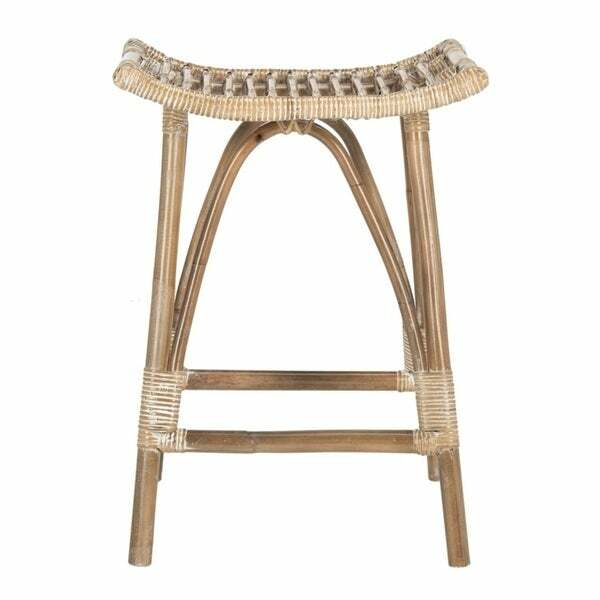 Safavieh Leda White/ Grey Rattan Bar Stool - 17.7" x 17.7" x 31.1"
Safavieh Atara Grey Barstool (Set of 2) - 17.8" x 18.5" x 30"
Designed to bring warmth, texture and style to the contemporary interior, this rattan counter stool is an investment. Crafted with natural mindi wood, its white wash finish complements any open plan dining area. Designers love its gently curved seat. Dimensions 17.72 In. X 17.72 In. X 25.2 In. The stools arrived in 4 separate boxes in great condition. We have only had them a few days but have received several compliments on their style. I plan on using the stools with and without a tie print pad. Which will give the stool a different look. It’s the perfect height for my bathroom makeup counter and also the perfect color! Can’t wait until it arrives! "What are the weight restrictions for this stool?" "What are the measurements? " Dimensions are: 17.72 In. X 17.72 In. X 25.2 In. Safavieh Kipnuk Grey/ White Indoor Outdoor Stool - 20.5" x 20.5" x 30"